In today’s geek confession; I collected stamps as a child. I choose them for the design and colour, rather than any conscious theme. Tonga was a favourite source country as their stamps came in crazy shapes. It gave me a door to other countries, I would go and find the country in the atlas and try to learn about it. On my first trip to China I met an amazing woman from Norway. She was travelling the world on the money she had made by selling a stamp collection she had inherited. She decided it was a good use of the money to see some of the places the stamps had come from. My father still collects stamps, his collection is a thoughtful compilation of stamps featuring ships. It’s his thing, and on a recent visit to Dublin we made a special trip to the GPO for him to collect the only souvenir he wanted. However stamps are in decline, both through the rise of email, and the change in technology. Businesses use franked envelopes, Dutch stamps now come as stickers, not suitable for collections, and the Danish have dropped stamps altogether opting for a code that you can receive via text. So what happens to stamp collectors? I visited central post offices in London, Dublin and Vienna various trips in the last year or so and all had special collections for sale, often as attractive sheets and first day covers. Stamps as a practical item are all but obsolete, given our growing use of email. But there is still a market for them as an asset, like a very specific, very tiny, art form. Stamps have become significant as commemorative items; one was issued last year for the 70th wedding anniversary of Queen Elizabeth II and Prince Philip, there’s likely to be one this year for Prince Harry’s wedding, a new stamp was released in the US this month to commemorate the life of Lena Horne as part of Black History Month. Some commemorations are politically dodgy; since the 1970s Australia has issued Australia Day stamps, with varying degrees of blindness to the colonial history, and this year acknowledged Aussie Greats in entertainment. The stamps are aimed at collectors rather than letter senders. Stamps value goes up according to their rarity value. But for collectors of commemorative stamps the value will be a combination of the numbers printed, the life of the stamp, and the importance of what they commemorate. 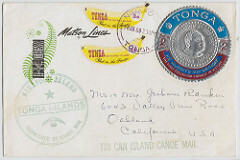 I suspect the banana stamps of Tonga’s heyday are a thing of the past. Stamps have outgrown their commodity status and emerged as (almost) pure assets. In 2011 a 1948 Indian stamp of Mahatma Gandhi sold for EUR 144,ooo, more than a million times its face value, the highest value for a modern day stamp at the time of auction. Another stamp commemorates a different sort of record; the stamp that’s travelled the furtherest has been to Pluto, there’s no auction value for it. Yet. Now, where did I put that stamp album? I read a lot about stamp collecting being in decline, but since the post office issues so many commemorative stamps, that probably isn’t really true. Check out a few blogs here (not mine specifically as my topics range a lot) and you might get a slightly different picture. As for stamps that are stickers–I am pretty sure collectors have some up with a way of dealing with that. Please check around. Now, as for making a lot of money. Yeah, it is unlikely that any new stamps (last 40 years) will ever be worth a ton of money. That’s just the truth. However, they do provide an excellent window into a culture and what it values and celebrates. They also make great souvenirs. The self-adhesive stamps aren’t as easy to collect for two reasons (1) they don’t come in standard singles or with perforations that traditional stamps have (2) it seems only the mint stamp retains value, where as used traditional stamps were floated off the envelope and collected. There’s lots of discussion amongst philatelists on the best way to present them – still. (Loads of recent discussions on stamp collecting discussion fora). It’s the window into culture and other countries that stamps gives that I loved as a child.